The FIX NYC panel released its full report, today recommended a series of measures to reduce Manhattan congestion. Update: The Fix NYC advisory panel released its full report on Friday morning. You can read it right here as a PDF. My questions below are still relevant, and I had some initial reactions via a thread on Twitter. “I have received the report from Fix NYC and will review it carefully. I thank the panel for their hard work and effort. I will discuss the alternatives with the legislature over the next several months. There is no doubt that we must finally address the undeniable, growing problem of traffic congestion in Manhattan’s central business district and present a real, feasible plan that will pass the legislature to raise money for MTA improvements, without raising rider fares. A uniform pricing model for FHVs that discourages continuing presence in the central business district and incentivizes trucks to deliver on off peak hours is a necessary component. Tolls must be more fair. Trips to and from New Jersey can be less expensive than trips from New York City’s outer boroughs. Tolls vary widely, and they must be rationalized so costs are fair to all. The report accurately points out that the objective is not to raise tolls entering the borough of Manhattan, but more specifically those trips adding to the congestion in a defined central business district. But, as a born and raised Queens boy, I have outer borough blood in my veins, and it is my priority that we keep costs down for hard working New Yorkers, and encourage use of mass transit. We must also find a way to reduce the costs for outer borough bridges in any plan ultimately passed. I still wonder if this is a real plan he intends to champion or something he will use for cover to claim he tried to fix NYC’s traffic problems but could not overcome Albany resistance. My original post follows. This is a better plan than I expected and approximates Michael Bloomberg’s doomed proposal from 2008. That we have gone nowhere in the past decade is very telling, and that this plan doesn’t come with East River Bridge tolling parity is disappointing. But a Start is a start is a start, and if Cuomo accepts this plan, it can be a building block to something better and more complete down the road. If the 59th St. and Brooklyn Bridges aren’t rolled and can be used to enter or exit the cordon zone without paying the fee, how can we protect against massive increases in traffic across those bridges? What transit upgrades can be implemented by 2020 that will be sufficient enough for the panel to be comfortable with the implementation of the traffic fee? Reliability and capacity increases take years or decades to see through, and not months. Can anyone really Fix NYC without MTA construction cost reforms? Is this a real plan that stands a chance of passing the New York State Assembly and Senate or is this just a CYA report to bolster Cuomo’s reelection campaign? With the Cuomo-supported plan to give Senate control to the state Republicans via the breakway IDC Senators, any traffic plan faces a tough hurdle in the state legislature. Will Cuomo push for this plan so that it passes the Senate or is just supposed to make him look like he tried, but failed, to fix city streets, traffic and the MTA? Will the mayor finally experience his own come-to-Jesus moment on traffic pricing or will he continue to lie, distort reality and reverse himself in discussing a plan that will impact guys like him who live in NYC for decades but are seemingly allergic to the subway? Do all of the players involved realize congestion pricing is only one part of fixing the bus network and solving transit woes and that other reforms are badly needed? Some of these questions should be answered in Friday’s report; others may take a few weeks to unfold as we see the political forces line up behind (or against) the Fix NYC recommendations. Either way, this is a start and, while far from perfect, a good one at that. Hollywood these days is suffering from reboot fever. Spider-Man, now a part of the all-encompassing Marvel Cinematic Universe, witnessed its third stab at the webbed avenger in 15 years while the all-female Ghostbusters drew headlines last year. By some accounts, there are over 120 reboots in the works. New York, now a city to be left out of the latest trends, wants to join in, and the reboot may just be a traffic pricing plan. When last we left congestion pricing, so many years ago, the City Council had approved Mayor Bloomberg’s request but it died a closed-door death in the New York State Assembly when the now-disgraced Sheldon Silver killed it. This move was a blow to home rule and a blow to an effort to rationalize East River tolls and reduce the ill effects of congestion pricing. It killed a potential steady stream of income for transit investments and killed the productivity gains that would come with limited single-occupancy vehicle traffic in the busiest parts of Manhattan. Now, as the mayor and the governor square off over transit funding, some form of a traffic pricing plan seems to be back on the table. It’s a reboot, baby, and this time, our mayor is the villain (or perhaps just playing one). “Congestion pricing is an idea whose time has come,” Mr. Cuomo said. He declined to provide specifics about how the plan would work and what it would charge, but said that he had been meeting with “interested parties” for months and that the plan would probably be substantially different from Mr. Bloomberg’s proposal. “We have been going through the problems with the old plan and trying to come up with an updated and frankly better congestion pricing plan,” Mr. Cuomo said. A key priority is making it as palatable as possible to commuters from the suburbs and boroughs outside Manhattan without undercutting the primary goals: providing a dedicated funding stream for the transit system, while reducing traffic squeezing onto some of the country’s most gridlocked streets. …Unlike a tax on wealthy New Yorkers, which would be limited in scope and affect a relatively small number of people, congestion pricing would have a far broader impact on people inside and outside the city. After Mr. Cuomo’s past skepticism that state lawmakers would support congestion pricing, his willingness now to support the idea may improve its fortunes in Albany. As we speculate about Cuomo’s ideas for congestion pricing and what comes next, Streetsblog, in response to Mayor de Blasio’s complaints about unfairness and “penalizing” the Outer Boroughs — has written a thoughtful defense of the Move New York plan. This plan would rationalize tolls across all river crossings into Manhattan and provide money for transit upkeep while reducing congestion. The real wild card here though is Cuomo. We don’t know what he wants to do, and his plans have always been, well, his. He’s proposed half-baked plans for Penn Station, a backwards AirTrain for Laguardia and an overpriced Penn Station Access. He hasn’t shown a willingness to let experts help guide him to the best decisions, and everyone seems to be holding their breaths on congestion pricing. New York has an opportunity to get this right, but we can’t let it slip away. While congestion pricing won’t solve every transportation ill, it’s piece in a larger puzzle of solutions that will. It’s up to Cuomo to lead properly, and so far, he has a very mixed record on that very topic. But stay tuned. This reboot hasn’t played itself out yet, and as the 2018 gubernatorial campaign inches into view, this won’t be the last we hear of it. For certain reasons, The New York Times seems to bury its urban policy editorials on Saturdays, and a pro-congestion pricing missive published on May 21st continued the trend. I didn’t have an opportunity to write it up last week, but for a few reasons, it’s worth revisiting. It’s a ringing endorsement of the Move New York plan, but I worry that supporters are putting too much hope on a plan that, when judged on its merits only, is very worthwhile but isn’t the single silver bullet it is often made out to be. Move NY would also give the M.T.A. the money and authority to establish new subway lines. One of the most promising proposals is for a line to connect the Bronx, Queens and Brooklyn over existing rail tracks,…which supporters call the Triboro Rx…Similarly, the plan includes a proposal to turn existing Long Island Rail Road tracks between the Atlantic Terminal in Brooklyn and Rosedale in Queens into a new subway line…Finally, the legislation would set aside money for transit projects in the Hudson Valley and on Long Island. It would also create new bus service and reduce fares on express buses. And it would give money to neighborhood community boards to invest in local projects like bike lanes, bus depots, public plazas and station repairs. Considering the MTA needs four or five years of Move New York revenue to fulfill the planned budget for Phase 2 of the Second Ave. Subway alone, that’s a lofty goal for what is, in New York City, a relatively paltry $1.35 billion a year. Of course, the MTA can bond out that money against revenue-generating projects but between all of these competing projects plus the need to expand service rapidly to make up for the demand congestion pricing will place on the transit network, that $1.35 billion won’t go nearly as far as The Times hopes. And that’s the key: By itself, Move New York is a very worthwhile piece of a larger transportation puzzle. It should help alleviate congestion on city streets while providing another stream of dollars for transit investment, but it’s not the silver bullet. In a Tweetstorm in response to The Times editorial, Yonah Freemark of The Transport Politic summed up this argument. Moreover MoveNY will likely INCREASE Subway use by discouraging driving around the city. The MTA needs money, and the city’s streets need to be cleared of as many cars as possible. But the MTA also needs political support, massive cost and work rule reform, a plan to build and deliver projects quickly and efficiently, and operations reform. Move New York is a start, but it’s one piece of the puzzle, not the entire puzzle itself. Flippant headline aside, someone — or a group of someones — is thinking creatively about the MTA’s capital funding problem. It’s been a long time coming, but Sam Schwartz and the Move NY coalition unveiled their restructured traffic pricing plan on Tuesday. If implemented properly, it could generate $1.5 billion that the group says could be bonded out to support the MTA’s capital plan. It may kick the debt can even further down the road, but it’s the most promising proposal we’ve seen at a time when Gov. Cuomo has seemingly left the MTA out to dry. The details of the plan — now being called the Move NY Fair Plan — contain a mixture of new revenue streams in the form of East River bridge tolls and givebacks in the form of reduced current tolls that should appease everyone. No one will be double-tolled, and all money would be collected electronically so toll gates and the alleged traffic they could cause will be a non-factor. The plan, in a nutshell, is simple, and I’d urge you to read Streetsblog’s primer. Essentially, tolls on current MTA bridges would drop while the currently-free East River bridge crossings would carry a charge, restoring a 104-year-old wrong. The money would go toward transit, and the corresponding drop in clogged streets would be a major boon for all New Yorkers. The plan would see a new taxi surcharge as well as congestion pricing for automobile trips south of 60th St. in Manhattan, and off-peak tolls would be cheaper than rush hour charges. In return, Move New York promises massive transit investments. In their report [pdf], they highlight how the MTA would have a steady revenue stream that would lead to implementation of the agency’s capital plans. The coalition believes the MTA would have the money to restore bus service cut in 2010, reduce the City Ticket fares on Metro-North and LIRR, speed up SBS and BRT implementation, and address the subway system’s technological and physical issues that come with age and the need for modernization. All in all, it sounds good. Interestingly, while as Dana Rubinstein astutely noted, Gov. Cuomo and the MTA were silent on the plan yesterday, it’s drawn support from unlikely sources. Mark Weprin, a City Council member who opposed then-Mayor Bloomberg’s congestion pricing plan, voiced his support as did Ydanis Rodriguez, chair of the Council’s transportation committee. The prospects for a home-rule message though remain murky as the New York State Senate GOP, with no better ideas or funding solutions, has come out against the plan. Without acknowledging that no funding solution will lead to less service and drastically higher fares, a State GOP spokesman said, with a straight face, “Hardworking New Yorkers are paying enough already.” Talk about obliviousness. Anyway, I digress. The editorial boards for The Post and Crain’s New York, two of the tougher constituents to impress here, voiced their support, and real estate and business interests may actually line up behind this plan. Streetsblog again explored the changing political dynamics behind the Move NY Fair Plan, but as Stephen Miller noted, “The key to the plan, though, is Governor Cuomo.” If the Governor supports this idea, it will become reality; if he doesn’t, the MTA is up a $15.2 billion creek with fare hikes and service cuts as their only paddle. Make of that what you will. It’s not too often we get a direct glimpse into the minds and inner workings of a New York City politician attempting to come to grips with transit policy, but this weekend’s Daily News provided us with just that opportunity. 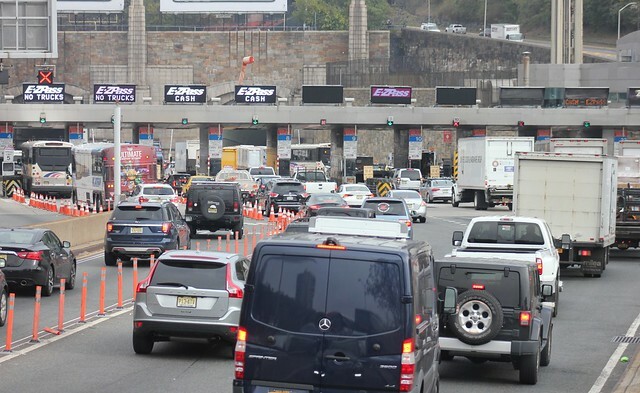 Appearing in print at around the same time we learned of his support for a Soundview ferry, Bronx Borough President Ruben Diaz, Jr. penned his take on Sam Schwartz’s Move NY toll plan. His critique is flawed and shows the battle anyone fighting for transit in New York City faces. To make this toll plan work, supporters this time are pledging to lower the tolls on outer-borough bridges, such as the Robert F. Kennedy and Verrazano Bridges, in order to entice support from those communities that rejected this proposal in 2008. What “Move NY” has proposed is likely a Trojan horse. While the promise of lower tolls is certainly alluring, there are no guarantees that those tolls would stay low forever. In fact, given the history of this city’s bridges and their tolls, we can be certain that these so-called “lower” tolls will surge back to their original heights in short order. If revenue is required, we can raise money in other ways. For starters, we should charge drivers to register their cars based on the vehicle’s weight and level of fuel efficiency. Not only will this incentivize drivers to choose hybrid or electric cars, it will place the burden of new funding on the vehicles that cause the most congestion and pollution. We must also begin to implement new transit plans that will lower congestion by providing alternatives, and not through new bridge taxes. This includes improvements like ferry service in Williamsburg, the Rockaways and Soundview, and new Metro North service in the East Bronx. Just how, pricing supporters will ask, do we pay for such relatively inexpensive transit upgrades without a new pricing scheme? I would say that we have been paying all along, and that it is time for the other boroughs to be treated as “fairly” as Manhattan has been. I don’t know if Schwartz’s plan is the answer to the transit funding woes, but it’s an answer. At some point, too, it will be the path of least resistance toward garnering a dedicated revenue stream for the transit system. But it’s not regressive, not by any stretch. I wouldn’t expect much more from a politician who thinks that a ferry that would serve a ridership in the low triple digits is a game-changer, but it does provide a glimpse of the mindset pervasive in the boroughs, City Hall and Albany. Misguided thinking is no way to set policies that impact millions.